Each year, the Western Michigan Chapter of the Associated Builders and Contractors awards a Craft Professional of the Year (COPY) at their Excellence in Construction Awards. The award is given to an individual who sets a high standard for professionals in their craft by exhibiting outstanding skills and leadership. The recipient of this Chapter award demonstrates a passion for the trade, taking pride in hands-on work, and the satisfaction of a job well done to benefit both the construction industry and the greater community. The winner is a master of skills whose commitment to excellence makes them the ultimate example of success in the field. Often times, buildings are recognized for their design or the overall construction team that built them but the people responsible for the construction of those projects are sometimes over-looked. West Michigan is blessed to have some of the best skilled tradespeople in the country who show up to the jobsite every day ready to work tirelessly. 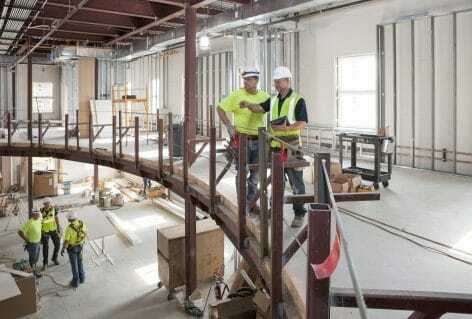 Electricians, plumbers, fabricators, carpenters and the like are the unsung heroes of the jobsite. Many have spent 10, 20, 30 years performing and perfecting their craft; and when they come together as a team they create works of art. This year, the finalists for the CPOY award are Shaun O’Brien (Buist Electric), Joel Newton (Windemuller Electric) and Scott Wondergem (Elzinga & Volkers Construction Professionals, Inc.), each of them is outstanding in their field and their community. They are great representations of the men and women working in our industry. Gone are the days of the stereotypical, unkempt, tobacco chewing, rampant cursing construction worker. Look through the fencing on a local construction site, notice the clean, tucked in shirts, the comradery amongst the team and the professional manner in which they are working. We feel privileged to work alongside the talented individuals we have working in the field. We were honored to have the opportunity to nominate Scott for the CPOY award and look forward to nominating other men and women in the future. We need to spend more time praising our people, not just our projects. All the nominees will tell you that it takes a team to complete even the most simple of construction projects. The next time you are heading east on 196, as you near downtown after the Market Street Exit, take a look to your right at the city skyline and think about the hands that built it. Think about how each individual brought their talents to the team as a whole to provide a safe, quality building to serve our community. The Craft Professional of the Year Award will be given out at the Excellence in Construction Awards hosted by the west Michigan chapter of ABC (Associated Builders and Contractors) on September 13, 2018. For more information on this event, please visit www.abcwmc.org.